Global capital markets have been in flux over the past few months, to say the least. In early April, Japanese Prime Minister Shinzo Abe launched the second arrow of “Abenomics.” After 15 years of chronic deflation, the Bank of Japan set an inflation target of 2 percent and announced a plan to buy $75 billion a month of Japanese government bonds. This led to the Nikkei index to run up by roughly 30 percent through mid-May. Much of the money that flooded into Japan was pulled out of emerging markets. Brazil in particular reacted to try and lure foreign capital back into the country. Years ago, while the U.S. and European economies were mired in recession, Brazil put in place capital controls in the form of the IOF tax to prevent hot money inflows from strengthening the real against the dollar. Since then, the Brazilian economy has stalled, and in mid-June the Brazilian government removed most of the IOF taxes, including the 1 percent tax on derivatives. Thus far, we have only received hints of the biggest development yet to come. Starting in April, the U.S. Federal Reserve began hinting that it would likely wind down QE3 and begin tapering its purchase of bonds later this year. Although the talk of tapering being imminent has been put to rest for now, it is only a matter of time until the Fed begins to wind down its $85 billion a month purchase of bonds. In a preview of the eventual effect tapering will have, yields on benchmark 10-year U.S. Treasuries were up more than 80 basis points from the beginning of May through the end of June. The swap spread is a useful tool to speculate or hedge against changes in the supply and demand of the U.S. Treasury market, changes in the federal government deficit or responses to the expectation of increasing interest rates. A swap spread consists of a Treasury bond leg and an interest rate swap leg, with each leg acting as a proxy for the perceived riskiness of government debt and bank debt respectively. When concerns arise regarding the creditworthiness of the banking system, the resulting flight to quality in Treasuries leads to a rise in the yield of interest rate swaps relative to government debt, and a widening swap spread. Conversely, if investors and credit rating agencies become concerned about the creditworthiness of government debt (not that that would ever happen…), people may pull money out of Treasuries, leading to a rise in the yield of government debt relative to bank debt and a narrowing swap spread. Supply and demand mechanics of the Treasury market can also influence the swap spread. When a persistent federal deficit is expected, and with it the expectation of an ample supply of Treasuries, Treasury yields rise relative to swap yields and the swap spread narrows. When deficit projections decrease, expectations of a shrinking supply of Treasuries will cause spreads to widen. Perhaps one of the biggest influences on the swap spread is mortgage convexity hedging. When interest rates rise, the likelihood of homeowners refinancing decreases and the duration of outstanding loans increases. In response to the increase in duration and an increase in the amount of interest they can expect to earn from mortgages, investors will look to sell long-dated assets. The effects of this hedging are more pronounced in the swaps market than the Treasury market, usually leading to a widening of swap spreads. When interest rates fall, investors will look to buy swaps, often leading to a narrowing of the swap spread. A swap spread trade is typically constructed by buying (or selling) a Treasury bond and paying (or receiving) the fixed rate of an interest rate swap with an identical maturity. The same trade, known as an invoice spread, can be built using Treasury futures and Eris Exchange interest rate swap futures. Using an invoice spread can result in significant margin savings of up to 75 percent compared to a swap spread using the cash products. Eris Exchange actually lists a flex contract specifically designed to lend itself to constructing an invoice spread. The Eris invoice spread leg contract has the same maturity as the cheapest to deliver Treasury underlying the 10-year U.S. Treasury future available on either the Chicago Board of Trade (CBOT) or NYSE Liffe U.S. Even though Eris contracts are futures, they match the cash flows of a typical over-the-counter (OTC) interest rate swap. As a result, an Eris product offers the best of both worlds: like an OTC swap, it can serve as a proxy for corporate credit risk, while also offering the capital efficiencies of a futures product. 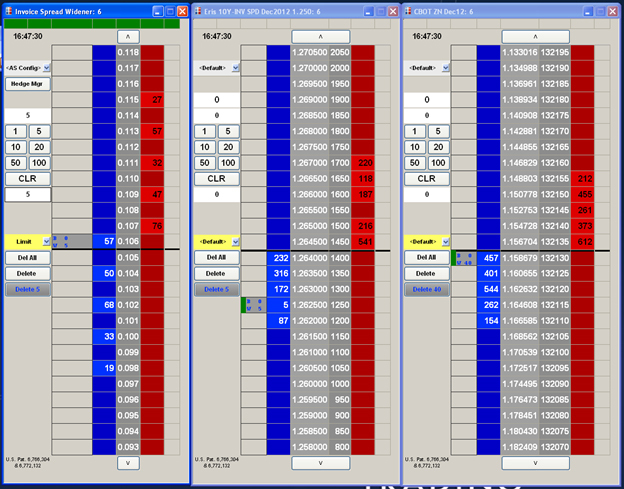 Trade the Eris Exchange invoice spread with TT’s X_TRADER®. X_TRADER® 7.17 adds functionality that will make it easy to trade the invoice spread. 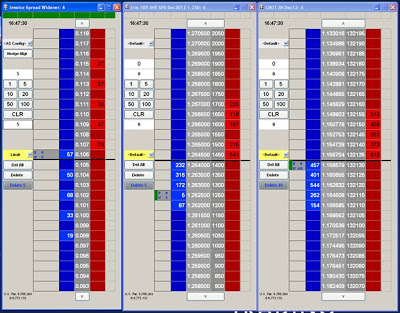 X_TRADER and Autospreader® have long allowed the trader to convert quotes for fixed income products—whether they be Eurodollars, Treasury futures or cash Treasuries—to an implied yield. The Eris invoice spread leg contract has a fixed coupon, and is quoted in net present value (NPV) terms. X_TRADER 7.17 will allow you to convert this NPV-quoted price to an implied yield. The only parameter the trader needs to supply is the PV01 value for the swap, or the price sensitivity of the swap to a one-basis-point change in yield. 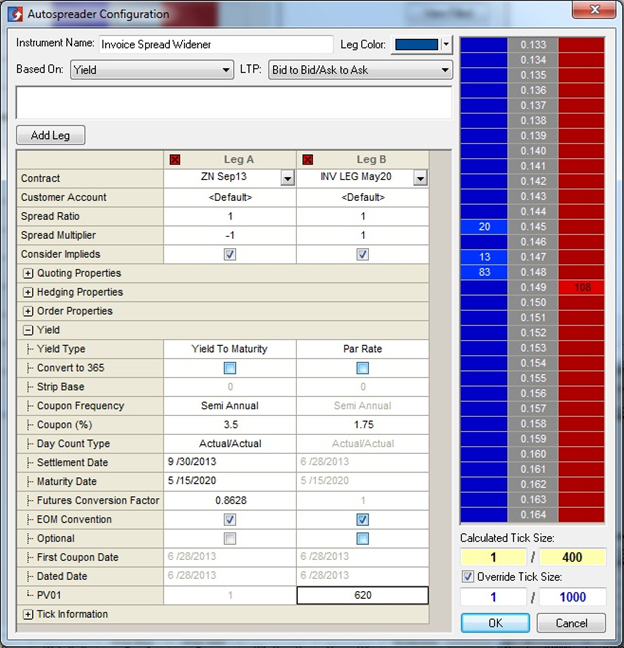 The PV01 value for a given swap is available through many market data services. Configuring the Eris Exchange invoice spread in TT’s Autospreader®. Both the CBOT Treasury futures leg and the Eris swap futures leg can be converted to an implied yield, making it simple to set up the spread between the two contracts. Additional information regarding how to set up an invoice spread is available on our website. With our new functionality and our newly available access to Eris Exchange, traders looking to stay ahead of the Fed have yet another tool in their arsenal.